Brundage-Bone, which operates in 80 cities across the country, has been based in Denver since 1983. When Dale Bone and Jack Brundage started their concrete pumping service in Denver in 1983, they had two pumps, and Bone’s nephew was their only employee. But the young businessmen had a taste for acquisitions, and they began expanding beyond Colorado almost immediately. The growth continued over more than three decades, and despite a rough patch that came with the Great Recession, Brundage-Bone today calls itself the largest concrete pumping company in the world. The Denver Post was unable to confirm this claim, but Brundage-Bone is certainly big and expanding internationally, and its appetite hasn’t diminished. The company has more than $200 million in revenue and nearly 1,000 employees, said chief executive Bruce Young. It operates in 20 states and 80 cities across the country. The company has been making acquisitions in the United Kingdom, and in June expanded its reach there when it bought St. Helens, England-based Reilly Concrete Pumping, bringing Brundage-Bone’s market share in the U.K. to 30 percent. It’s in every U.K. country but Northern Ireland. 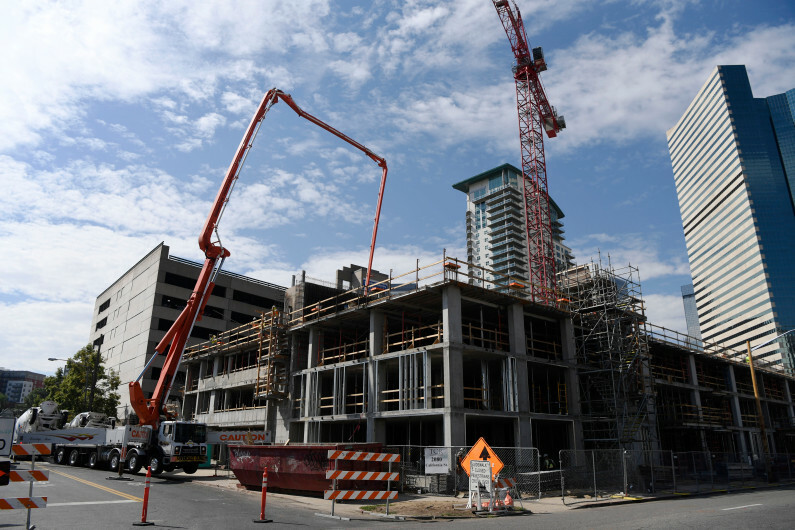 Brundage-Bone laid down the concrete for the Pepsi Center, Coors Field, Mile High Stadium, Denver International Airport and high-rises across metro Denver. Fifty-five percent of Brundage-Bone’s business comes from commercial projects, Young said. The company expanded quickly in the early days, Bone said. A year after its founding, Brundage-Bone expanded its operation into Dallas. The following year, it had acquired a concrete pumping company in Seattle. The company would continue to make acquisitions like these in the coming decades, extending their reach across the Southwest and West Coast. Bone, now 74, retired in 2008. He attributed taking risks on new concrete pumping technologies like the crane-like boom pump as one of the biggest factors of Brundage-Bone’s growth. Before pumps were commonplace, concrete placing companies were moving concrete through wheelbarrows and motorized buggies, Bone said. They could move a yard of concrete in two to three minutes. With boom pumps, it’s exponentially faster. Bone also said Brundage-Bone’s loyal team greatly affected its expansion. Many workers have been with the company for 30 years, he said. Young has been with Brundage-Bone since 1985.
ittle about the company’s headquarters just off East 64th Street, about 5 miles north of downtown, gives away its size. Aside from a few large trucks parked behind the building, each one equipped with an equally large orange boom pump on its back, there’s nothing out of the ordinary. Although Brundage-Bone continues to grow — Young said the company plans to extend its reach in the South in the coming years — it took a major hit during the recession. The company filed for Chapter 11 bankruptcy and was bought out by a Los Angeles-based investment company in 2014.